St Ives Cornwall, a seaside town and fishing village in the far west of England. Coming down for a holiday? There is lots of accommodation, from bed and breakfast to guesthouse to cornwall cottage to hotels to holiday parks to camping and self catering in the town or a short drive away. Lots of places to eat from pasty shops to pizzerias, to cream teas, not forgetting several boutique restaurants and cafes, many with a seafood theme that have opened in the last few years, offering not only award winning cuisine, but some with stunning views of the harbour. How about this for a sample menu? Steamed Cornish mussels, or trio of local fish- monkfish, lemon sole and haddock, or home made fish pie-with Newlyn landed cod? With narrow winding cobbled streets and passages, a magnificent harbour, and superb beaches, all just around the corner from Lands End. In summer the hanging basket are a delight to the eye. Those in front of the St Ives Tourist Information Centre, at the Guildhall, deserve a particular mention. In times gone by, the town relied upon the pilchard, waiting anxiously for the cry of the huer, sighting the massed shoals offshore. At dawn men in open boats still ply the wide sweep of the Bay for mackerel, landing them late morning, straight into boxes to be covered with ice. Don't trip on the gear and nets piled high. Keep away from unfenced drops. Tate Gallery The town has long been a favourite with artists, and home of the Tate Gallery St Ives. In 2002 it had its 2,000,000 visitor. It has introduced modern art to an entirely new audience. Not forgetting the Barbara Hepworth Museum and Sculpture Garden. The Beaches mention must be made of the beaches, each with a character of its own. Porthmeor faces the Atlantic Ocean, popular with surfers. Around the headland the wide sweep of Carbis Bay, Porthminster Beach with Godrevy Lighthouse in the distance, favourite with families. Christmas and New Year. St Ives comes alive from its out of season slumber. Nearly all the shops and galleries have Christmas Decorations with of course a Xmas tree complete with lights above their front window. It is nice just to stroll along the cobbled streets and passages, and walk around the harbour at this time of year. Especially so if the low winter sun is shining. Other Things to do. 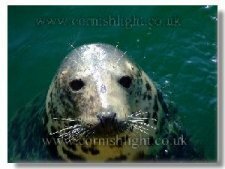 In season take a boat trip down the Cornish Coast to Seal Island, where if you are lucky you will see seals. Hire a motor boat to explore the harbour. Horse-riding and golf. Fancy a walk? The Coast Path is unspoilt and lovely. Only 8 miles drive away are St Michael's Mount, Newlyn and Mousehole. The Coast road provides wide sweeping and memorable views along its entire length, as it winds and twists its way the 13 miles to Lands End. Cape Cornwall, Churn Castle, Botallack, Wheal Owles, Gurnards Head. Fancy a drive? Head west towards Lands End along the Cornwall Coast and explore the unique landscape of West Penwith, rugged wave lashed granite cliffs, small fields, granite hedges, prehistoric remains, ruined mine engine houses, such as those at Botallack, clinging precariously to the cliffs, heather covered spoil heaps- the stark relicts of a once thriving mining industry. Where men toiled deep underground, with woman and small children on the surface processing the ore in all weathers. Mining was a hard brutal existence, where men's working lives underground often ended by the time they were in their 30's. Sheltered coves such as Cape Cornwall and Sennen Cove with its blue flag beach popular with surfers. Small open boats on the slipway. It is a nice drive right around the Peninsula, as far as Lands End turning east to Minack Theatre at Porthcurno hence to Mousehole and Newlyn, home of the largest fishing port in Cornwall.